Marios Nicolaou was born in Limassol in 1974 and studied percussion at the Conservatory of Athens (class D. Marinakis) and at the Hochshule für Music Köln with C. Caskel and C. Tarcha and graduated with “Auszeichnung”. Marios has been a holder of the “Alexandra Trianti” scholarship of the Athens Megaron. Since April 2015, Marios is the Principal Timpanist of the Cyprus Symphony Orchestra. As a soloist with the orchestra, he has performed works by Milhaud, Panufnik, Skalkottas and Druschetzky. 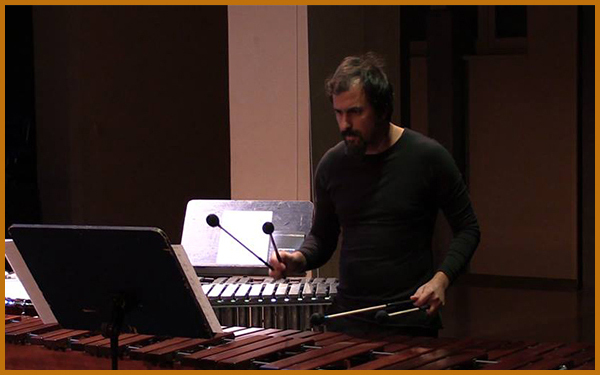 As a Percussionist, he has collaborated with the most of the Greek orchestras. Marios has given recitals and took part in festivals such as the Klang Spuren Festival, the Klavier Festival Ruhr, the Pharos Contemporary Music Festival, the Cypriot Composers Union Festival and he is musician in residence at the Avaton Music Festival. His collaborations include musicians such as P. Eötvös, H. Lachenman, D. Bouliane and leading ensembles such as the Ensemble Neue Music Köln, the Ensemble dissonart and the Moscow Contemporary Music Ensemble. Marios teaches Percussion at the Arte Music Academy as well as at the Music Lyceums of Nicosia and Limassol and is also a member of the Ergon Ensemble (Athens) and the Chronos Ensemble.